Last June I wrote an article about ticks and Lyme disease, too. It has, unfortunately, become one of our important, although depressing, signs of both spring and summer. 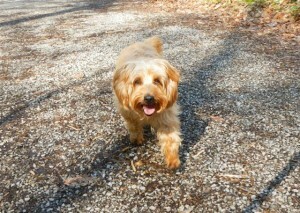 My dog, Izzy, had a tick last January (during one of the warm spells of our strange winter!) and just got another one a couple of days ago. 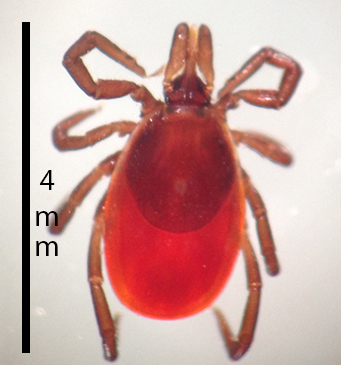 After a short winter break, the ticks are back! 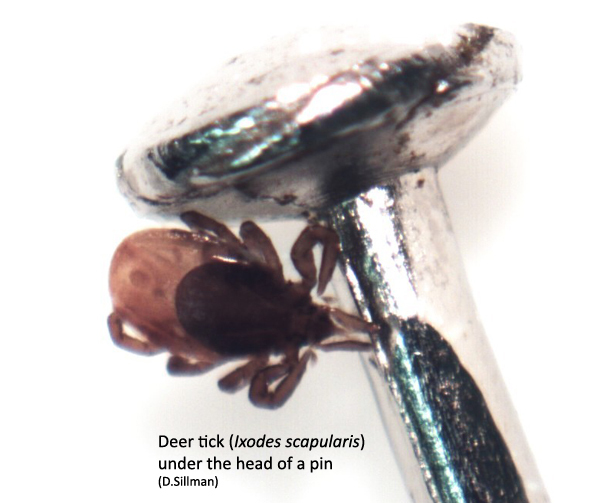 Pennsylvania is experiencing a population explosion in black-legged ticks (the tick formerly called the “deer tick” but most precisely known as Ixodes scapularis). This tick is small and quite common, and it is found throughout the northeastern and north-central parts of the United States. The reason for its observed increase is not precisely known. Some interesting explanatory hypotheses include the exploding populations of rodents (especially white-footed mice) particularly in our suburban ecosystems. Fragmentation of forests and the optimal conditions of suburban habitats for these mice along with significant declines in their natural predators have led to great increases in their numbers. Black legged ticks, then, in their larval and nymphal life stages are very likely to find a white-footed mouse on which to feed. These mice are also significant reservoirs for the bacterium that causes Lyme disease, so the ticks that get their blood meal from them have a very high probability of assimilating and then passing on these bacteria. A second hypothesis that tries to explain the increases in ticks suggests that the observed increase and apparent spread of these ticks involves their return to habitats from which they had been previously extirpated. Tom Simmons of Indiana University of Pennsylvania speculates that Pennsylvania’s forests were once loaded with black legged ticks. Clearing of these forests (95% of Pennsylvania’s forests, as we have talked about previously, were cut sometimes repeatedly since European settlement) and the destruction of the native deer populations (a favorite host of the adult stages of the black legged tick) forced these ticks into greatly restricted habitats from which, as both forest cover and deer populations have recovered, they are now emerging. Possibly both hypotheses (along with some that haven’t even yet been articulated) are leading to the explosion and spread of both the black legged tick and its symbiotic, Lyme disease causing bacterium (Borrelia burgdorferi). For the last several years, Pennsylvania has led the nation in the number of human cases of Lyme disease (in 2014 there were 7487 conformed human Lyme disease cases in Pennsylvania up from 5904 cases in 2013. I have not been able to find either Pennsylvania or national Lyme disease data for 2015, but I have a feeling that the numbers have increased again!) Further, the Center for Disease Control (CDC) state that the number of reported Lyme cases in the United States (30,000 in 2014) was only 10% of the total number of cases. A lot of people are experiencing Lyme disease! Eggs deposited in the fall in low, grassy or scrubby vegetation hatch the next summer into the very small, six-legged larva life forms. These tiny ticks typically seek out small hosts (like a white-footed mouse or a bird) but are able opportunistically to attach to larger mammals including humans. These larva, though, are not born with any of the pathogens associated with Ioxdes scapularis and are, thus, unable to transmit any of its diseases (a small piece of good news!). If these larvae feed on a host that is carrying one of I. scapularis’ bacterial or viral pathogens, though, that tick will become infected with that disease causing agent and will carry it and be able to transmit it throughout the rest of its life cycle. After the larva has taken its blood meal it molts into the larger, eight-legged nymph life form. This molt often is delayed until the following spring. These nymphs, then, seek a host for their blood meal. These hosts are usually mammals ranging in size from white-footed mice to dogs to cats to deer to humans. Because of the timing of this nymph emergence the spring (May and June here in Western Pennsylvania) is a time of great risk for ticks bites (and disease transmission) for humans! After the nymphs have taken their blood meals they molt into adults. These adults are especially abundant in the fall. These much larger ticks (like the one in the picture to the left) typically attach to large mammals like white-tailed deer. The female adult ticks take a large blood meal from their hosts and then use the energy from this feeding to make eggs. The adult male ticks attach to the same hosts, but do not feed (and, therefore, do not transmit pathogens at this stage). They are there to find a female and to mate! The males die shortly after mating and the females die after dropping off of their hosts to lay their eggs in the grassy and scrubby vegetation. Those eggs then overwinter and hatch in the summer to start the life cycle all over again. The Pennsylvania Department of Environmental Protection collected and tested black-legged ticks and determined that 34% of them carried Borrelia burgdorferi. It is not known if this is an increase from previous years or not, but these data will provide a comparison baseline for future tick assessments. 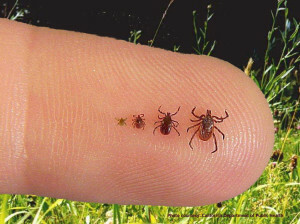 A few things to remember about ticks and Lyme disease: black-legged ticks are not able to begin blood feeding (and consequential pathogen transfers) until they have been attached to a host for at least 36 hours. Careful examination for ticks and their rapid removal is the best way to prevent contracting the Borrelia bacterium. Preventing tick attachment is an even better strategy to avoid Lyme disease. Also, ticks don’t drop out of trees onto you, they attach to your legs or arms when you brush against vegetation on which the tick is waiting. So, wear long pants and long-sleeved shirts when out in the woods or fields, use DEET-based insect repellents on socks, pant legs, etc. A thorough “tick check” after being out in a potential tick habitat is also a very effective way to reduce the chance of infection. Careful examination for ticks and their rapid removal is the best way to prevent contracting the Borrelia bacterium. Tick removal is best accomplished using a pair of forceps or a v-slotted, commercial “tick-remover.” Gently pull the tick from its spot of attachment making sure that you remove the feeding structures (the “head”) along with the body. Then dispose of tick in whatever creative way you might wish! If you do happen to miss an attached tick you have about a 2% chance of having the Lyme disease bacterium transferred to your blood stream. A few days after a tick bite most people will experience a red bump at the site of the wound. If the tick has transmitted the Lyme bacterium typically (70 to 80%% of the time) the localized redness of the wound will expand over 3 to 10 days into a 5 cm (or more) diameter circular rash. In some individuals the pattern of the redness takes on a “bull’s eye” configuration, but it can just as easily simply be a large red circle. Early Lyme disease can then develop in 1 to 4 weeks in the form of a flu-like illness with fever, fatigue and body aches. If you have been out where you might have encountered a black legged tick and have then observed the red spot expanding into red circle (whether or not the fever syndrome has developed), this is the time to contact your doctor! Antibiotics are extremely effective at this point in preventing the development of most of the serious side effects of Lyme infections! Untreated Lyme disease can lead to neurological problems, joint pain and a cluster of other, fortunately, uncommon symptoms. “Post-treatment Lyme Disease Syndrome” (PTLSD) (sometimes referred to as “chronic Lyme’s disease) is a very serious but also very preventable condition. Johns Hopkins Medical Center emphasizes that early antibiotic treatment (within 72 hours of a tick bite) with a single 200 mg dose of doxycycline can prevent the development of Lyme disease. If treatment is delayed and Lyme symptoms develop, then longer durations of antibiotic treatment are required. (for more information about Lyme disease I recommend checking out the John Hopkins Lyme Disease Clinical Research Center. Dogs can also develop Lyme disease. Most dogs (95%) that receive the Borrelia bacterium via a tick bite actually show no symptoms at all. Those dogs that do react to the bacterial infection often develop lameness in one of their legs that typically lasts for a few days. The lameness can then shift to another leg and can be quite debilitating. In some dogs the Lyme infection can also lead to kidney disease and even kidney failure. The number of dogs who get Lyme disease each year is not known. There is no centralized reporting system to monitor this disease. Anecdotally, I can report that my local vet, a small mostly rural practice, saw well over 100 Lyme disease cases last spring and summer! If every vet is seeing similar numbers, there is truly an epidemic of Lyme affecting our dogs! 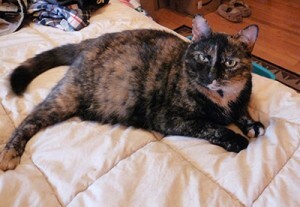 Cats can also be hosts for black legged ticks and have, therefore, the potential to encounter the Lyme bacterium. The Cornell University College of Veterinary Medicine, though, emphatically states that cats are not able to get Lyme disease from tick bites. The bacterium is either not able to be transferred from tick to cat during a blood meal or the transferred bacterium is not able to survive and replicate in the cat. Welcome to summer, everyone: days of sun and warmth (and mosquitoes and ticks)! We have the very good along with the bad! I concur with Jennie. Q: do the tick treatments for dogs lower their risk of aquiring KLyme disease? Good, if sobering, reminders, Bill! The photos and info are very helpful. Adding DEET to my shopping list! Thanks for including a happy photo of Izzy, too!